Gardaí have launched an investigation after a TV viewer claimed comments made by Stephen Fry on an RTE show were blasphemous. Independent.ie can reveal that a member of the public reported the allegation to Ennis garda Station following a broadcast of ‘The Meaning of Life’, hosted by Gay Byrne, in February 2015. The story has been picked up by the media, in Ireland and abroad – including the BBC, CBS, the [UK] Independent, the Irish Times, RTE, the Mail online, The Journal.ie the Sunday Times (sub req’d), the Observer, the Sunday Telegraph, and the Sydney Morning Herald. The crime of blasphemy is provided for in section 36 of the Defamation Act, 2009 (also here). 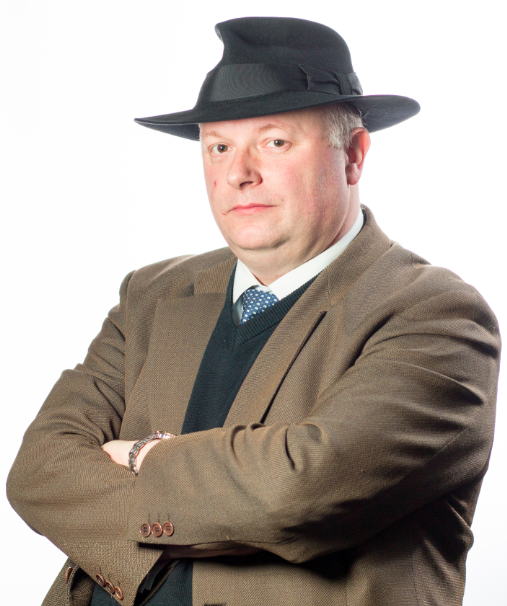 Subsection (1) provides that a “person who publishes or utters blasphemous matter” shall be guilty of an offence; anyone guilty of the offence is liable to a fine not exceeding €25,000. Subsection (2) provides a threefold definition of when a person publishes or utters blasphemous matter. First, the matter in question must be “grossly abusive or insulting in relation to matters held sacred” by a religion. Second, it must cause “outrage among a substantial number of the adherents of that religion”. And, third, the person who published or uttered the blasphemous matter must intend to cause such outrage. I’m not sure that any, let alone all, of these three elements were made out by Fry’s interview. An articulate challenge to God is not gross abuse or insult to a religion; controversy is not outrage; and candidly defending atheism is not intentionally causing outrage. However, even Fry’s if comments do meet these criteria, subsection (3) provides that it is a defence to prove “that a reasonable person would find genuine literary, artistic, political, scientific, or academic value” in the relevant matter. I think that Fry’s interview would easily meet that standard; just as I thought that an Irish publication of the Charlie Hebdo cartoons of the Prophet Mohammed would too. As Atheist Ireland told the Sunday Times (sub req’d), the Garda investigation “highlights a silly, silencing and dangerous law”. But it should not have come to this. Freedom of expression is protected by Article 40.6.1(i) of the Constitution, and the last sentence of that paragraph provides that the publication or utterance of blasphemous matter is an offence punishable by law. In Corway v Independent Newspapers  4 IR 485,  1 ILRM 426,  IESC 5 (30 July 1999) (noted here), the Supreme Court held that there was no clear statutory definition of blasphemy to give effect to this provision. Section 36 was enacted to fill that legislative gap. On Monday 27 January 2014, the Constitutional Convention published its Sixth Report, recommending the removal of the offence of blasphemy from the Constitution. But the last government kicked the issue to touch; and the current government’s most recent Legislation Programme (pdf p17) says only that “preliminary work has commenced” on a Bill to provide for a referendum on removing the crime of blasphemy from the Constitution. I contributed to the deliberations of the Constitutional Convention that led to this recommendation, and I am disappointed that it has not been implemented. The image on the right is the Scene at the Signing of the Constitution of the United States, by Howard Chandler Christy. 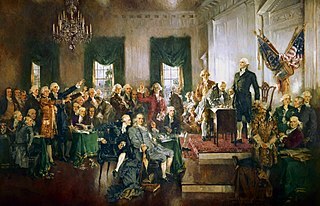 It is the culmination of the Constitutional Convention which took place in the Assembly Hall in Independence Hall, Philadelphia, Pennsylvania, in 1787, and which drafted the US Constitution. In Ireland, a Constitutional Convention was established by Resolution of the Houses of the Oireachtas (the Irish Parliament) in July 2012 to consider the desirability of various amendments to the Irish Constitution. The Constitutional Convention had its first session in Dublin Castle in December 2012; its subsequent sessions were held in the Grand Hotel in Malahide, Co Dublin as well as in various regional venues (pdf), until it completed its work on 31 March 2014. On 02 November 2013 (some video here), the Convention considered the constitutional crime of blasphemy, in the Tara Room in the Grand Hotel, Malahide. It was an excellent venue; but only time will tell whether the proceedings inspire similar artistic works. Tom Arnold, the Chair of the Convention, opened proceedings by re-articulating the principles underpinning the work of the Convention: openness, fairness, equality, efficiency, and collegiality. And he said that fairness and efficiency were of particular relevance to the Convention’s consideration of blasphemy. Fairness was important, because, although there were many submissions on the issue, they were predominantly in favour of removal of offence of blasphemy from the Constitution; but there is another side; and, in upholding the principle of fairness, the Convention actively sought to ensure that other views were heard too. Efficiency was important, as there was a great deal of work to do. He also clarified that, whilst many submissions argued that the blasphemy provision is part of a wider debate about the relationship between Church and State, he advised that this wider issue was not on the agenda for the day, though it could return the following day when possible future work was considered. The first session consisted of three expert speakers. First up was my TCD colleague, Dr Neville Cox, who spoke about the background to the current State of Irish blasphemy law (on which you should see his magisterial, but eminently readable, tome, as well as the shorter, accessible, paper he prepared for the Convention (pdf)). He began by observing that the 1937 Constitution is unusual in specifically listing a crime, especially within a clause relating to the protection of freedom of expression. The Taoiseach (Prime Minister) at the time, Éamon de Valera said that the provision reflected the existing common law crime of blasphemy. It was not a controversial clause; indeed, although the language is mandatory (blasphemy “is an offence”) the main criticism was that it wasn’t sufficiently stern enough. As to the definition of blasphemy in Article 40.6.1(i), Neville said that, in the three main monotheistic religions, blasphemy consists of an attack on the sacred by saying something that simply must not be said. From this perspective, the wounding to the individual is a byproduct of the saying of the unsayable. Hence, on this view, the proper focus of blasphemy law should be on the words themselves and not on their effect of the words. However, although the common law, from the early 1600s, used various justifications to explain the blasphemy laws, none of them came back to this concept of prohibiting the saying of the unsayable. Instead, the Courts took an institutional approach to the crime of blasphemy: since the Church of England was the established Church and thus part of the law of the land, the targeting the Church of England and its doctrine would undermine the law of the land. But, by the end of the 1800s, this rationale lost currency, and by 1917 (in Bowman v Secular Society  AC 406), the House of Lords held that blasphemy protected the religious sensitivities of the individual; but the courts still confined the scope of the offence to the established Church (this was confirmed as recently as 1991 in R v Chief Metropolitan Stipendiary Magistrate, ex parte Choudhury  1 QB 429). It was against this background that Neville considered the question: what does the constitutional crime prohibit? He felt that it (probably) prohibited speech that would have a significant detrimental impact on the sensitivities of religious believers. Moreover, he pointed out the Defamation Act, 1961 (also here) provided a procedures for the prosecution of criminal libel, including for private prosecutions of blasphemy. In 1991, the Law Reform Commission (in a Consultation Paper and Report) recommended that, on an appropriate occasion, the last sentence of Article 40.6.1(i) should be removed. On the other hand, he pointed out that the European Court of Human Rights has afforded Member States a significant margin of appreciation in such sensitive religious and moral matters, and had held that there was nothing objectionable about a blasphemy law per se [see, for example, here]. He also pointed out that the Organisation of Islamic Cooperation has been active on the international plane, seeking UN Declarations on Defamation of Religion; though, since 2011 the UN has moved away from this perspective. The last prosecutions for blasphemy at common law were in the 1850s, and Neville said that Corway is the only attempt (so far) to rely on the Constitutional provisions. The applicant sought to commence a private prosecution for blasphemy. The High Court rejected his application, on the grounds that it was not “clear at first sight that there is beyond argument a case to answer if the matter goes before a criminal court” ( 4 IR 485,  1 ILRM 432,  IEHC 27 (23 October 1996)  (Geoghegan J)). The Supreme Court dismissed his appeal, on the grounds that “in the absence of any legislative definition of the constitutional offence of blasphemy, it is impossible to say of what the offence of blasphemy consists” ( 4 IR 485,  1 ILRM 426,  IESC 5 (30 July 1999)  (Barrington J)). Section 36 of the Defamation Act 2009 was introduced to provide just such a legislative definition; but, in Neville’s view, that provision is so hard to operate that it is effectively unenforceable in practice. Neville having provided a map of how we got to where we are, I then sketched out some possible routes to reform. The paper I prepared for the Convention is here (pdf). I suggested that there were four constitution questions for the Convention. Should Article 40.6.1(i) be left as it is? Should it be amended by removing the reference to “blasphemous” matter? Should it be amended by removing the last sentence (which also refers to “sedition” or “indecent” matter)? Or should the entire Article be replaced by something more workable, which would better state the right and accommodate proportionate restrictions upon it (such as for religious reasons). And the answer to those questions would determine whether section 36 of the 2009 Act should be retained, amended, repealed, or replaced. Finally, in our session, Professor Maeve Cooke (UCD) gave a presentation on “Democracy and Religion from a Social and Philosophical Perspective”. She said that philosophy can serve as a general guide to dealing with issues, offer orientation and indicate directions, only at a high level of abstraction. She said that even social and political philosophy should abstain from specifics, especially specific pronouncements on matters of public policy. But she nevertheless took the view that philosophy can come to the conclusion that there ought not to be a constitutional prohibition on blasphemy, because of its impact on human flourishing, on what it means to live a good life as a human being. Her argument proceeded in four steps. First, all human beings are deserving of respect as ethical agents, capable of forming and pursuing their own views as to what it is to live the good life. Second, the general and foundational legal and political principles constituting the State should be acceptable to everyone. Third, there is a plurality of perspectives on what the good life is. Fourth, if these principles are accepted, then it is hard to avoid coming to the conclusion that there is no room for a constitutional offence of blasphemy: since blasphemy requires a belief in God, and since a great many people do not believe in God, respect for their autonomy requires the absence of constitutional prohibitions based on belief in God. However, she qualified this by stating that, although there ought not to be a constitutional prohibition on blasphemy, there could be a legislative one. She said that human beings are social, and the good life is inextricably bound up life with others – so, if one citizen suffers, that is a matter of concern for all; so, if a citizen suffers from a religious insult, that is a matter of concern, and that concern can be reflected by provisions in the criminal law. She concluded that believers can learn from non-believers, and vice versa; so, in the context of blasphemy, non-believers can learn something about the power of naming, and can learn that concept of blasphemy offers an important and enriching view of the place of religion in the world, even/especially those who do not believe in God. During the various discussions, Neville clarified that an express constitutional reference to blasphemy, or even to the protection of religions, is not necessary to have a statutory offence of blasphemy. He said that a definition of blasphemy would be too much detail for a Constitution, which is a document of principle cast in general terms, to be filled in by legislation and judicial interpretation. And he was scathing of the Supreme Court in Corway, for abdicated their responsibility to interpret the word “blasphemy” in Article 40.6.1(i). It was pointed out that many of the arguments against blasphemy were rooted in approaches to human rights bound up with post-WWII rights instruments (such as the Universal Declaration on Human Rights (1948), and the European Convention on Human Rights (1950)), which are Western in origin. It was also pointed out that different cultures take different views on these issues, and the Universal Islamic Declaration of Human Rights (1981) and the Cairo Declaration on Human Rights in Islam (1990) are emblematic of emerging alternative international human rights norms, which are more sensitive to the interests of those of sincere religious faith. And it was therefore argued that a constitutional provision that protects religious belief and sensibilities was valuable in a multi-cultural, multi-ethnic society with multiple religious beliefs. Moreover, it was feared that removing blasphemy from the Constitution would amount to downgrading the status of religion, and that taking it out (or leaving it in) would have an important symbolic significance for the nature of the State. Others argued that such a provision has no place in constitution for secular society in which there is separation between Church and State. It was also argued that the blasphemy provision does not do any harm as it stands, and that removing it could open up a can of worms. On the other hand, it was argued the provision is unworkable, in that the Courts have refused to define it, and the legislature has made a bad fist of doing so, in particular by making it too easy to claim that offence is caused against religious belief [a prophetic fear, as it turns out, given the complaint about Fry]. It was also pointed out that sufficient legislation already exists in this area, specifically the Prohibition of Incitement to Hatred Act, 1989 (also here), section 1(1) of which provides that the hatred, incitement of which is prohibited, “means hatred against a group of persons in the State or elsewhere on account of their … religion …”. In this context, Maeve posed the question whether the UK’s Racial and Religious Hatred Act 2006 would be a possible alternative to Ireland’ blasphemy law, and a roadmap for amending the 1989 Act. Neville pointed out that there is an important difference between blasphemy and incitement to hatred, that the two laws do not do the same thing, and in particular that that protecting religious sensitivities is not the primary aim of incitement offences. Nevertheless, there was a great deal of discussion about the relative merits of a blasphemy offence and an approach based on prohibition of incitement to religious hatred. When it came time to take decisions and make recommendations, 61% of the members of the Convention voted against keeping the current offence of blasphemy in the Constitution, and 53% voted to replace it with with a new general provision against incitement to religious hatred, 50% voted that this should be accompanied by legislative provisions, and 82% voted that these provisions should provide more detail on the prohibition on incitement to religious hatred. The sooner heed is taken of these recommendations, the better. Thereafter, we will not have to suffer the embarrassing spectacle of a fatuous complaint. But, until then, Fry can take some comfort from the fact that, despite the complaint, he is not in danger of a prosecution. 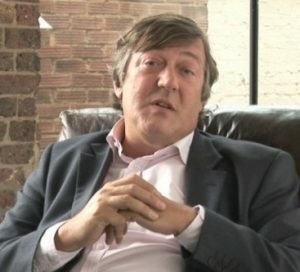 Irish Times: Stephen Fry will not be prosecuted for blasphemy. Irish Independent: New Zealand hints they will get rid of blasphemy laws after garda probe into comments made by Stephen Fry. Broadsheet: Hello, Progress on a Prime Time package on the cartoon at issue in Corway (view here from 16.04).